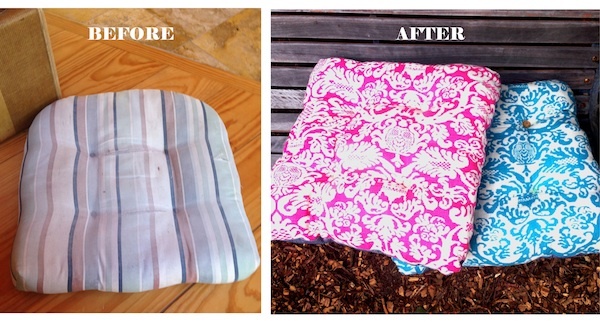 For the past couple of summers, my donated outdoor cushions have been on a severe downward decline (see above photo). After surveying the outdoor cushion market with my mom, I realized there were a lot of ugly and/or expensive outdoor cushions out there. So, I decided to do it myself. And you know what I discovered? This project is so simple! Any novice sewer can easily tackle this one. The result is gorgeous outdoor cushions suited to your taste. 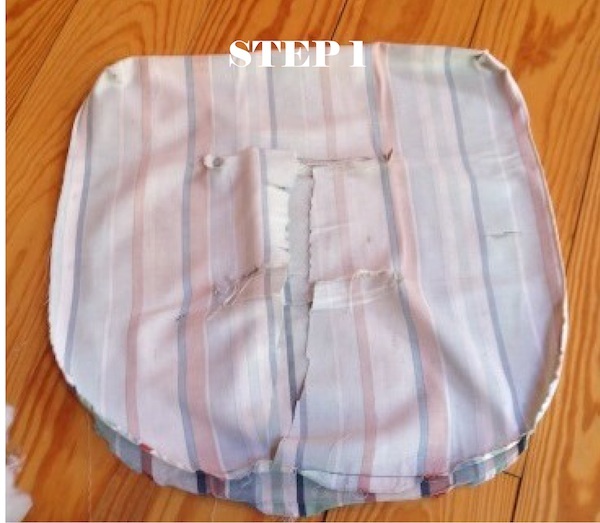 Step 1: Rip apart your old cushion. OK, well not completely—you want to try to preserve the fabric so you can use it to draft the pattern for your new cushion. Here’s a shot of mine with the stuffing ripped out. Step 2: Trace the old cushion pattern onto the new fabric (don’t forget to do top and bottom) and add an inch for seam allowance (you can do less than an inch but I like to give myself room for error). Note: I just made my patterns pieces square shaped with round edges rather than a semi-circle on one side as shown in my old cushions. It’s OK—do whatever shape you want to do. Step 3: Cut out all your new pattern pieces. If you want, you can stack a bunch and cut them all together. I made four cushions, so I had eight pieces of fabric. Step 4: Place fabric right side to right side and pin around the edges. Be sure to leave an opening on one side (the side that is up against the back of the chair) to put the stuffing in. Step 5: Sew! I recommend a 2.5 to 3 stitch length. You can then either cut the seam allowance with pinking shears, serge, or leave as is. Step 6: Turn right side out and add stuffing from old cushion. Step 7: Fold exposed seam edges under and sew up hole. You’ll want stiches to be short (2 to 2.5 and close to the edge). Step 8: Try to distribute the stuffing around evenly. Step 9: Mark buttons. I took a piece of paper and cut it into a square, about 6-inches by 6-inches. I then placed this in the middle of the pillow (I hate to admit it, but I eyeballed it) and put a small dot on the fabric (in pen) where the four corners were. This is where my buttons went. Step 10: Sew buttons. I used embroidery thread and an embroidery needle because I wanted to add some more color. Make a good secure knot and then start on the top side of the cushion, pushing through to the back. Again, I eyeballed this, but aim to make it line up with the button hole on top. Make a small stich and then pull back to the top. String through button and pull back through to bottom. Around now is when you’ll want to be pulling the thread really tightly so that the front and back cushion fabrics are touching. Finally, pull back through to the top, wrap around the base of the button a couple times and finish in a knot by pulling the needle through one of the loops you just created around the button base. Do whatever you need to do to make a knot and then just hide it under the button. Easy! Repeat four times per cushion. Enjoy your new one-of-a-kind, handmade cushions!